July: LIFE, LIBERTY AND THE PURSUIT OF HAPPINESS TO ALL! April: Art Walk is Back! Patricia Kilburg was invited to serve on the MAC Grants Panel. 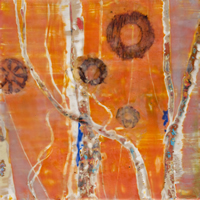 The Museum welcomed about 50 attendees for a talk and demonstration by Patricia Kilburg on the ancient art of encaustic painting using modern methods. 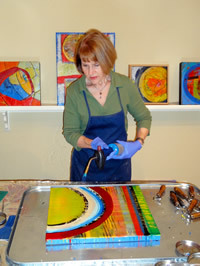 Ms. Kilburg will teach a workshop at the Museum on encaustic in January, 2011. 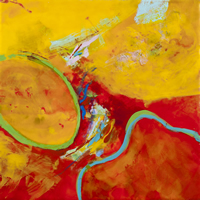 For being juried in to the South Carolina Watermedia Society annual exhibition for the third consecutive year, member Patricia Kilburg receives the honor of Member in Excellence. 10/25/08 “Sic Transit” Takes Award On October 25, 2008, “Sic Transit”, an acrylic/mixed media collage work by Patricia Kilburg, was given the M. Graham and Co. award by juror Mark E. Mehaffey, AWS, NWS, at the South Carolina Watermedia Society Awards Luncheon in Myrtle Beach, SC. One of the top thirty award winning paintings, the piece will travel for a year to locations scheduled by the SC State Museum. Patricia Kilburg featured on Carolina in the Morning. Click to see video. 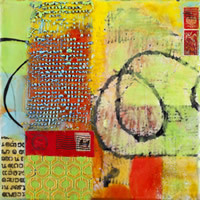 Perceptions: Mixed Media Collage by Patricia Kilburg, a solo exhibit of the artist’s work, opens Feb. 1 at the Guild Gallery in Spartanburg’s Chapman Cultural Center, Spartanburg, SC. On September 29, 2007, “Momentum”, by Patricia Kilburg received the HK Holbein, Inc. Merchandise Award at the South Carolina Watermedia Society 30th Annual Exhibition, Spartanburg, SC. Juror was artist John T.; Salminen, AWS-DF, NWS. Patricia Kilburg’s textile work “Romanesque VII” is installed in the official residence of the United States Ambassador to Guatemala, as part of the exhibition curated on behalf of the Honorable John Hamilton, through the Art in the Embassies Program. Contact Patricia for more info.